One ad couldn’t have been more obviously political. Targeted to people aged 18 and older, it urged them to “vote YES” on June 5 on a ballot proposition to issue bonds for schools in a district near San Francisco. Yet it showed up in users’ news feeds without the “paid for by” disclaimer required for political ads under Facebook’s new policy designed to prevent a repeat of Russian meddling in the 2016 presidential election. Nor does it appear, as it should, in Facebook’s new archive of political ads. ProPublica needs your help holding Facebook’s political ad system accountable. Please download our tool to catch ads Facebook is missing. 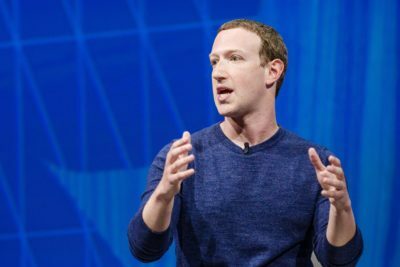 When The Hechinger Report appealed, Facebook acknowledged that its system should have allowed the ad to run. But Facebook then blocked another ad from The Hechinger Report, about an article headlined, “DACA students persevere, enrolling at, remaining in, and graduating from college.” This time, Facebook rejected The Hechinger Report’s appeal, maintaining that the text or imagery was political. As these examples suggest, Facebook’s new screening policies to deter manipulation of political ads are creating their own problems. The company’s human reviewers and software algorithms are catching paid posts from legitimate news organizations that mention issues or candidates, while overlooking straightforwardly political posts from candidates and advocacy groups. Participants in ProPublica’s Facebook Political Ad Collector project have submitted 40 ads that should have carried disclaimers under the social network’s policy, but didn’t. Facebook may have underestimated the difficulty of distinguishing between political messages and political news coverage — and the consternation that failing to do so would stir among news organizations. The rules require anyone running ads that mention candidates for public office, are about elections, or that discuss any of 20 “national issues of public importance” to verify their personal Facebook accounts and add a “paid for by” disclosure to their ads, which are to be preserved in a public archive for seven years. Advertisers who don’t comply will have their ads taken down until they undergo an “authorization” process, submitting a Social Security number, driver’s license photo, and home address, to which Facebook sends a letter with a code to confirm that anyone running ads about American political issues has an American home address. The complication is that the 20 hot-button issues — environment, guns, immigration, values foreign policy, civil rights and the like — are likely to pop up in posts from news organizations as well. “This could be really confusing to consumers because it’s labelling news content as political ad content,” said Stefanie Murray, director of the Center for Cooperative Media at Montclair State University. 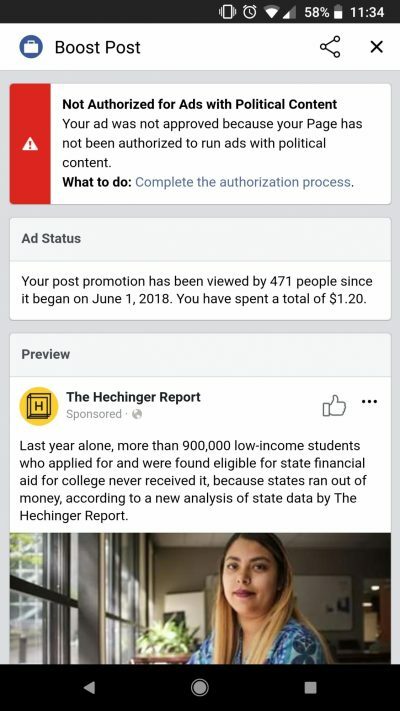 An ad from The Hechinger Report to promote an article about financial aid for college students was flagged as political by Facebook and prevented from running. The Hechinger Report joined trade organizations representing thousands of publishers this week in protesting this policy, arguing that the filter lumps their stories in with the very organizations and issues they are covering, thus confusing readers already wary of “fake news.” Some publishers — including larger outlets like New York Media, which owns New York Magazine — have stopped advertising on the platform. “When it comes to news, Facebook still doesn’t get it. In its efforts to clear up one bad mess, it seems set on joining those who want blur the line between reality-based journalism and propaganda,” Mark Thompson, chief executive officer of The New York Times, said in prepared remarks at the Open Markets Institute on Tuesday. In a statement Wednesday, Campbell Brown, Facebook’s head of global news partnerships, said the company recognized “that news content was different from political and issue advertising,” and promised to create a “differentiated space within our archive to separate news content from political and issue ads.” But Brown rejected the publishers’ request for a “whitelist” of legitimate news organizations whose ads would not be considered political. “Removing an entire group of advertisers, in this case publishers, would go against our transparency efforts and the work we’re doing to shore up election integrity on Facebook,” she wrote. “We don’t want to be in a position where a bad actor obfuscates its identity by claiming to be a news publisher.” Many of the foreign agents that bought ads to sway the 2016 presidential election, the company has said, posed as journalistic outlets. Her response didn’t satisfy news organizations. Facebook “continues to characterize professional news and opinion as ‘advertising’ — which is both misguided and dangerous,” said David Chavern, chief executive of the News Media Alliance — a trade association representing 2,000 news organizations in the U.S. and Canada —and co-author of an open letter to Facebook on June 11. ProPublica asked Facebook to explain its decision to block 14 advertisements shared with us by news outlets. Of those, 12 were ultimately rejected as political content, one was overturned on appeal, and one Facebook could not locate in its records. Most of these publications, including The Hechinger Report, are affiliated with the Institute for Nonprofit News, a consortium of mostly small nonprofit newsrooms that produce primarily investigative journalism (ProPublica is a member). Voice of Monterey Bay tried to boost an interview with labor leader Dolores Huerta headlined “She Still Can.” After the ad ran for about a day, Facebook sent an alert that the ad had been turned off. The outlet is refusing to seek approval for political ads, “since we are a news organization,” said Julie Martinez, co-founder of the nonprofit news site. Ensia tried to advertise an article headlined: “Opinion: We need to talk about how logging in the Southern U.S. is harming local residents.” It was rejected as political. Ensia will not appeal or buy new ads until Facebook addresses the issue, said senior editor David Doody. inewssource tried to promote a post about a local candidate, headlined: “Scott Peters’ Plea to Get San Diego Unified Homeless Funding Rejected.” The ad was rejected as political. Inewssource appealed successfully, but then Facebook changed its mind and rejected it again, a spokeswoman for the social network said. BirminghamWatch tried to boost a post about a story headlined, “‘That is Crazy:’ 17 Steps to Cutting Checks for Birmingham Neighborhood Projects.” The ad was rejected as political and rejected again on appeal. A little while later, BirminghamWatch’s advertiser on the account received a message from Facebook: “Finish boosting your post for $15, up to 15,000 people will see it in NewsFeed and it can get more likes, comments, and shares.” The nonprofit news site appealed again, and the ad was rejected again. For most of its history, Facebook treated political ads like any other ads. Last October, a month after disclosing that “inauthentic accounts … operated out of Russia” had spent $100,000 on 3,000 ads that “appeared to focus on amplifying divisive social and political messages,” the company announced it would implement new rules for election ads. Then in April, it said the rules would also apply to issue-related ads. The policy took effect last month, at a time when Facebook’s relationship with the news industry was already rocky. A recent algorithm change reduced the number of posts from news organizations that users see in their news feed, thus decreasing the amount of traffic many media outlets can bring in without paying for wider exposure, and frustrating publishers who had come to rely on Facebook as a way to reach a broader audience. 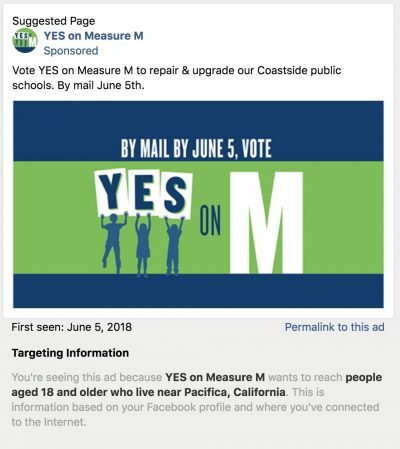 An ad on Facebook urges “vote YES” for a California school district’s proposed bond issue. It did not appear with a “paid for by” disclaimer nor was it recorded in Facebook’s new archive of political ads. Facebook has pledged to assign 3,000-4,000 “content moderators” to monitor political ads, but hasn’t reached that staffing level yet. The company told ProPublica that it is committed to meeting the goal by the U.S. midterm elections this fall. To ward off “bad actors who try to game our enforcement system,” Facebook has kept secret its specific parameters and keywords for determining if an ad is political. It has published only the list of 20 national issues, which it says is based in part on a data-coding system developed by a network of political scientists called the Comparative Agendas Project. A director on that project, Frank Baumgartner, said the lack of transparency is problematic. “I think [filtering for political speech] is a puzzle that can be solved by algorithms and big data, but it has to be done right and the code needs to be transparent and publicly available. You can’t have proprietary algorithms determining what we see,” Baumgartner said. However Facebook’s algorithms work, they are missing overtly political ads. Incumbent members of Congress, national advocacy groups and advocates of local ballot initiatives have all run ads on Facebook without the social network’s promised transparency measures, after they were supposed to be implemented. Ads from Sen. Jeff Merkley, D-Ore., Rep. Don Norcross, D-N.J., and Rep. Pramila Jayapal, D-Wash., all ran without disclaimers as recently as this past Monday. So did an ad from Alliance Defending Freedom, a right-wing group that represented a Christian baker whose refusal for religious reasons to make a wedding cake for a gay couple was upheld by the Supreme Court this month. And ads from NORML, the marijuana legalization advocacy group and MoveOn, the liberal organization, ran for weeks before being taken down. ProPublica asked Facebook why these ads weren’t considered political. The company said it is reviewing them. “Enforcement is never perfect at launch,” it said.